The stylistic demarcation zone between blues and soul music has long been an elusive one to define. 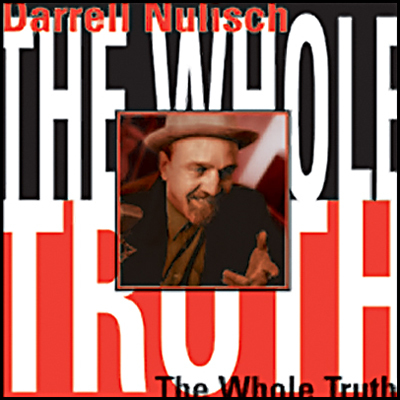 On The Whole Truth, Texas singer Darrell Nulisch offers a devastatingly effective solution: He sings the hell out of both genres. Now based in Boston, Nulisch brought a portfolio of soul-streaked originals (“There It Is,” “Stop Thinking Take [Start Thinking Give],” “One Night Lover,” and three more, all co-written with his longtime bassist Steve Gomes) and a fistful of well-chosen covers (George “Harmonica” Smith’s “Telephone Blues,” Percy Sledge’s “Love Me Like You Mean It,” Roy C’s “Leaving On The Morning Train,” Smokey Robinson & the Miracles’ “There’s A Sad Story Here”) into the studio, emerging with an album that runs the gamut of human emotions: love, heartache, sorrow, joy. In toto, The Whole Truth. A prolific songwriter, Nulisch has penned songs for artists such as Maria Muldar & Buckwheat Zyedeco. Along with Gomes, Nulisch’s backing crew included guitarist Jon Moeller (like Gomes, a veteran of Nulisch’s former band Texas Heat, which cut the critically acclaimed album (Business As Usual for Black Top), drummer Robb Stupka (a former timekeeper for the late Luther Allison), keyboardist Benjie Porecki, and the D.C. Horns. In addition to singing, Darrell displays his talent as a harmonica player on several selections on The Whole Truth. And that’s The Whole Truth. Check out Darrell’s entire Severn catalog: I Like It That Way; Times Like These; Goin’ Back to Dallas; and Just For You.